Our story began when we purchased a 1930’s Dutch Colonial on Maryland’s Eastern Shore. The kitchen had only a single cabinet in it and a huge radiator under an old farm sink. There was no storage or counter top and an ugly linoleum floor. We have been collecting and reusing for the past thirty years but we took it to the next level when we bought this house, mostly because we wanted to preserve the character of the house. On a limited budget, we began renovations by pulling up the old linoleum and exposing the original hardwood. Because it was in terrible shape, we decided to cover it with porch paint. Counter top and storage needs were next. 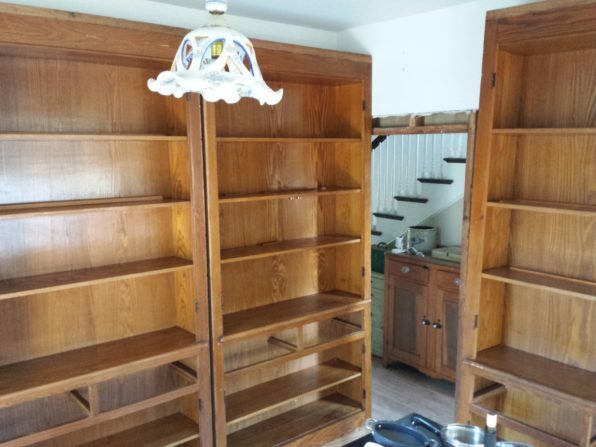 We found three turn-of-the-century chestnut butler pantries at a salvage place near us. We were able to move the kitchen door over to fit in all three pantries. We sanded, primed, painted and changed the hardware to match. 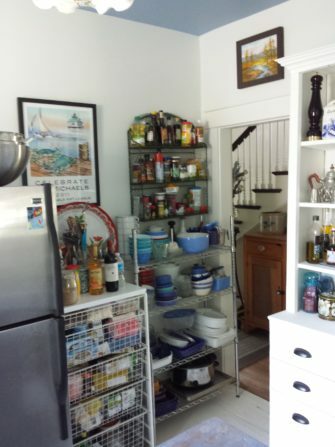 We later found a fourth old pantry online to fit a final, narrow spot between the window and the dining room door. It was a good height and width but it was way too deep. We had to take the back off of it and cut it down to fit the 13 inch depth of the space. We put the back on, sanded, primed and painted that as well. This solved the storage problem. Now on to the counter top and sink. First, we had to remove the monster under the sink, a 4 foot long radiator, and replace it with a shorter one that fit under the window. We got the shorter radiator from another area salvage place and stripped, primed and painted that as well. 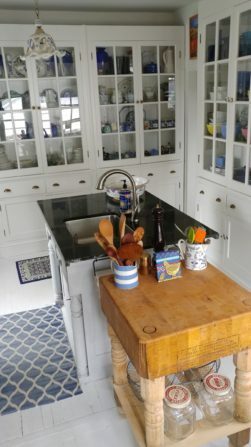 Finally, to solve the counter problem, we found an antique sideboard at a second hand store, and then at our favorite salvage yard, a granite top with a sink attached. We had the legs cut off of the sideboard and painted and stenciled it. A frame was built to support the granite top and we put them all together. To all of this, we added the butcher block that we got at a yard sale for $20. and added a lower shelf to bring it up closer to counter height. We love our kitchen and how it works with the rest of the house. 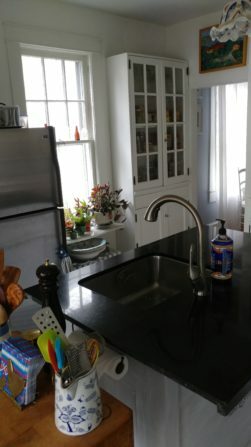 For those of you asking, what did we do with the farm sink…we gave it to our daughter who was also renovating an old house. It is now being reused in her master bathroom!